Megan here. Thanks for checking out my site! I have had an on-again-off-again relationship with building this site for about 4 years now. It was way harder than I had imagined it would be, and sometimes life distracts you. There were plenty of excuses I told myself over the years as to why it was not ready to go live, but I finally created something that I am so proud of. If you have been following me recently you’ll notice that there is a name change to my domain. I am 25 years old, living on the Gulf Coast with my sister, our pup Barley, and my kitten Shanti – if you follow me on Instagram then you know they are the main characters in my stories. My passion is yoga and being able to create and connect with others. I have my 200-hour Akhanda ytt certification from Divya Elting with Breathe Yoga and Wellness Center. My full-time job is working for my parents at Eastburn Woodworks where I manage our marketing, cook lunch and get to have Barley with me all day – it’s a pretty great gig. I have a lot of other interest outside of yoga which you will find under My Lifestyle tab where I will share what’s going on with me, DIY projects and must have items. Like most people, I love going on adventures of all kinds which you can follow along under the Adventures tab. I hope you take your time to explore through my site and find something that catches your interest! City of Thieves by David Benioff during WWII two young men are imprisoned and have a shot at saving their lives by securing a dozen eggs for a powerful Soviet colonel who wants them for his daughter’s wedding. Feel it Still by Portugal the Man I can’t listen to this song without dancing, can you? Currently my Bullet Coffee. Stay tuned for a post on how I like to make mine! I love how it keeps me energized all day and is full of nourishing goodness. New Movement if you have been to one of my classes lately, or just hanging out with me you’ve probably heard this playlist. I love the first and last song and thought they were a great way to slow down and listen. Coconut Cashew Coco-Roons The Original Superfood Cookie in Brownie. These babies are delicious and are my go-to snack in the mornings with my bullet coffee. They’re perfectly sweet and also come in a few other delicious flavors. 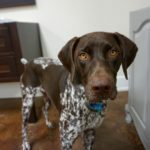 Barley is mine and my sister’s 3-year-old German Shorthaired Pointer. Somehow we got really lucky and he is actually pretty calm for his breed. Barley is a goofy pup and loves to chase birds, cats, mice, insects – especially flying ones, and lizards. He is also the biggest cuddle bug who wants to be protected from thunder and needs regular office snuggles. His favorite treats are carrots that still have the leaves on them and really any other food you offer him. Disclaimer: This blog is part of affiliate advertising programs which means that if you click on certain links on my website, I may make a commission from it. If I have partnered with a brand on one of my posts a disclosure will be made. All images are the property of Megan Rae Eastburn unless otherwise noted. All opinions are my own and with full honesty. Thank you for choosing to support me.